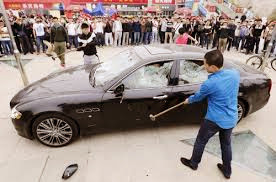 In an unusual show of emotion a Chinese man vented his anger at the Maserati dealers in Qingdao this week. Now as a non mechanical person myself I understand some of his frustration - here is what we are told. Rich Chinese man buys a Maserati - so far so good. Car is a bit of a dog and needs new parts while it is still under warranty. Car owner takes it back to dealer - parts get replaced - but not good Seems like this might have happened more than once. Some of the "new" parts are not new and at one point during the repair the Maserati gets scratched. Owner not happy - this is not his Maserati dream. So at this point we are all pretty sympathetic - but that is about to change. Car owner must have been beside himself with rage because when he finds out there is a car show in Qingdao and the Maserati dealer will be there he takes his car and some hired staff to car show; parks outside and then the hired hands proceed to smash up car with sledge hammers in this owners personal protest at the poor customer service provided by Maserati. Car does not look like it is in good condition now and I am pretty sure the Maserati dealer will be doing the Chinese version of "So what?"